A Royal Paladin Deck that fights by using “Blaster” cards together! Most of the cards in the Deck are “Blaster” Units! If 6 different “Blasters” are assembled, all allies gain Power and Critical! If you Drive Check a “Blaster”, you can Call it! When placed, Call up to 3 “Blaster” from the Deck, Drop Zone, Soul or Damage Zone (each)! You can recover 1 Damage! It becomes Grade 3 if you achieve the conditions! 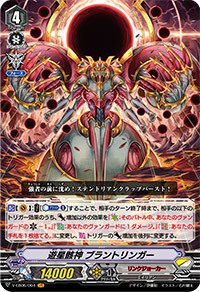 A Nova Grappler Deck that increases the amount you can attack with “Beast Deity, Auzre Dragon”! Your Grade 3 Units can attack multiple times! When placed, draw 1 card, and Call 1 card and battle the Vanguard! If it doesn’t Stand, it Stands! And, when it attacks on its own, it can Stand a Rear-guard! It’s an ace that lets you attack multiple times! If there’s a total of 4 or less cards among your hand and Rear-guards combined, draw 1 card! It’s a useful Unit when you’re running out of steam. By Retiring itself, you can Counter Charge 1 card! (1) Ride “Beast Deity, Azure Dragon”!! (2) Attack with “Azure” and “Beast Deity, Black Tortoise” during the Main Phase! Stand if they don’t Hit! (3) “Beast Deity, Scarlet Bird” can Stand all Units!! Stand “Azure” and “Perfect Raizer” multiple times to continuously attack!! You can attack up to 8 times during the Main Phase!! “Clay Doll Mechanic” can Counter Charge, allowing “Raizer Custom” to Boost further, allowing you to maintain high Power! A Kagero Deck whose ace card is “Dragon Overlord The Great”. Burning everything down in a powerful continuous attack! When placed, Call “Dragonic Neoflame” from the Drop Zone! If there’s a Grade 3 in your Soul, you can Stand it and “Dragonic Neoflame”! With this single card, you can attack quite a number of times! When “Dragon Overlord The Great” attacks, it gains Power+5000! “Great” can gain Critical+1 allowing you to attack multiple times with 2 Criticals! A Link Joker that takes control by inverting the effects of the opponent’s Triggers. Completely suppress Trigger Effects with “Wandering Starhulk Deity, Brandt Ringer”! An ace card that completely inverts all of your opponent’s Trigger Effects! Draw Triggers discard 1 card, while Front Triggers add Power to the Back Row! You can control the opponent with even more powerful inversions than “Brandt”! A key card that reverse opponent Trigger effects: Critical becomes Critical-1, meaning no damage gets dealt! If a Heal Trigger comes out, it instead assaults the opponent with an evil ability to deal 1 damage!